A new album of all original songs (one co-written with Gary Wright of "Dream Weaver" fame) by Danny O'Keefe. Songs of love and longing and hope for a better world for all of us. Danny O'Keefe is back again with a new album and it's a winner! He is not exactly a prolific recording artist, but his albums are always worth listening to. There's something in the lyrics and music that keeps you coming back for more over and over. 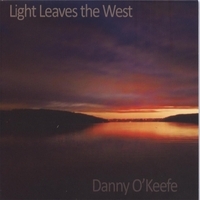 I highly recommend the latest album "Light Leaves the West" by Danny O'Keefe. Danny continues to astonish with his lyrical and melodic brilliance in some of his most intimate and moving songs to date. Beautiful production too. Do not miss this one!